I imagine that the only reason to watch this movie is for Arnold Schwarzenegger. His performance is campy and ridiculous, which is fine since the whole movie is ridiculous and campy. Schwarzenegger plays Howard Langston, a family man. Or, he would be if he didn’t spend so much time schmoozing with clients of his mattress business. 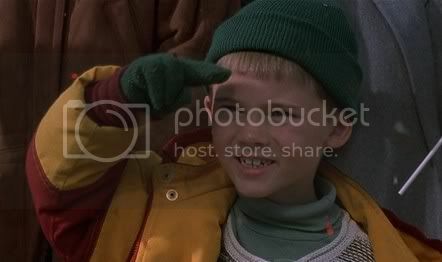 His work prevents him from spending much time with his wife, Liz (Rita Wilson, best known for being Tom Hanks’ wife), and son, Jamie (Jake Lloyd, best know for being slightly less annoying than Jar-Jar Binks). Howard misses Jamie’s karate class and instills a fear inside the kid that he will mess up Christmas. There’s only one thing Jamie, and every other boy in the world, wants for Christmas. 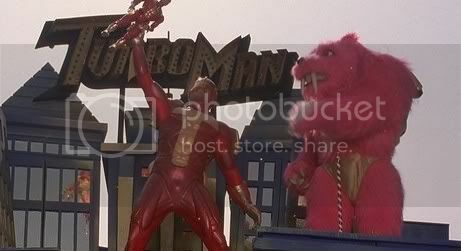 Lust for the new Turbo Man doll has reached a fever pitch and they are sold out everywhere. Of course, Howard doesn’t know this when he promises to get one for Jamie for Christmas and tells Liz that he has already procured the toy. On Christmas Eve morning Howard races to the toy stores, where he meets the obnoxious Myron (Sinbad). Myron is a postal worker, crazy with the stress of the holidays and delirious to obtain a Turbo Man doll for his son. The two of them engage in shenanigans for the majority of the movie as they race and fight to find the last doll in Minneapolis. The plot sounds stupid, and it is. The movie is basically a vehicle for Schwarzenegger in a more family-oriented genre than films like Predator and The Terminator. Outside of laughing at Arnold being silly, there’s not much good in the film. The writing is terrible, the action is terrible, the acting is terrible, the message is terrible. At the very end the film turns from its message of “buy your kid’s love with toys” to something more worthwhile, but the change is abrupt and not believable. One bright spot is Phil Hartman. You might remember him from such shows as “The Simpsons” and “Saturday Night Live.” In this film he plays the Langston’s neighbor, Ted. 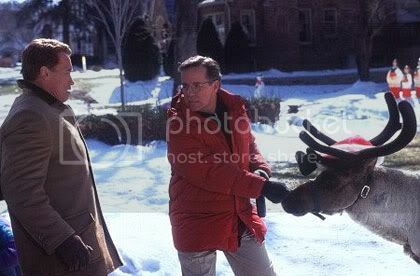 Ted does everything perfectly well, including procuring an actual reindeer to amuse the neighborhood children on Christmas. In a lot of ways he reminded me of a certain neigh-diddly-aybor named Ned. Ted’s advances toward Liz as Howard spends more time away from the family are amusing at times. Most of the film falls flat. An extended sequence in an underground cartel of black market Santa Clauses could have been funny, but it isn’t. I understand that the film is aimed at children, but that’s no excuse for terribly ridiculous action sequences. Sinbad is also a detriment to the film, as most of his screen time is taken up with monologues that wouldn’t be funny at a comedy club. 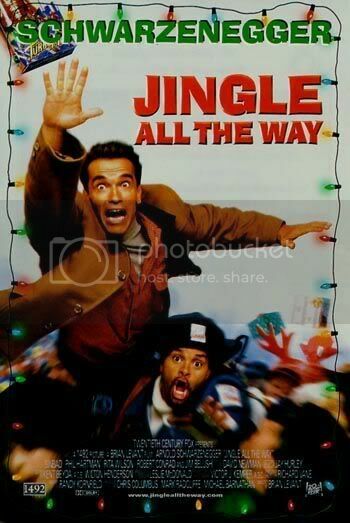 I could see how some people might enjoy Jingle All the Way. Fans of all of Schwarzenegger’s work will probably enjoy this campy outing, but others should stay away. I watched it with a large group of raucous people and it still wasn’t particularly enjoyable. This entry was posted in 1.5 stars, 2.5 pirate flags, J, Movie Reviews on December 24, 2009 by Tim Irwin.